Mobile businesses have become more ubiquitous not only here in St. Louis, but nationwide as a way to reach a more diverse customer base. You can see evidence of how businesses on wheels function here locally, particularly with unique ideas like mobile boutiques becoming quite successful. And marketing is just as important for mobile businesses as it is for traditional brick-and-mortar stores. Just like any other business operation, image quality and proper material matters in the response from passers-by. It’s why finding superior printing in St. Louis can help any local mobile business owner rise above their competition. The ideas for promotional items are extensive, and it can mean turning old ideas into something refreshingly new. Take a look at the creative products available to market a mobile business directly on a traveling truck, or at the location site. Even if a mobile business stays within the St. Louis area, the truck still has to travel local roads. When working as a startup, budgets are likely tight. As a result, owners of these vehicles can’t always afford to get a paint job with elaborate graphics. Why not use magnets to advertise directly on the truck? While this may sound unusual with a seemingly banal product, new techniques make these work at new levels. No longer are magnets just little objects stuck on refrigerators. Custom sizing and shaping is possible now thanks to new printing technology. For branding, it’s an excellent opportunity to create something compelling without having to pay a fortune. Since they stay firmly on vehicle surfaces, they act as a form of decal. Creating a larger magnet, mobile businesses can give the name of their business and other branding info all in one piece. These work just as well on smaller cars if having to travel regularly for business. Banners now come in a variety of useful sizes, shapes, and materials. Perhaps most people still relegate these to indoor events, like trade shows. Many still use them there, though banners have so much creative potential not utilized enough. Mobile businesses can use these to help guide people to the vehicle where food or other products get served. Thanks to banners with retractable stands, they’re also very portable and lightweight. Set up and tear down are a matter of just pulling or pushing the banner out or into a base. Material like 13-mil vinyl is essential for repeated outdoor use. With UV protection, graphics on the piece won’t fade when sitting in the sun for long hours. The vinyl even brings an impressive vibrancy to all imagery. For instance, a mobile food service can print real images of their sandwiches or other dishes for a vivid sense of detail. Since the images look almost real, this can quickly incite hunger in those walking by. For guiding people to a truck, banners are just as invaluable. Unique fonts and other lettering look extra sharp so they’re easily readable from a distance, or at various angles. Extras like fabric banners look just as impressive when placed on a truck’s exterior. With custom sizes available, fabric denotes true elegance if providing elegant services to locals. If banners help lead people to a mobile business’s vehicle, advertising flags give more information about available food or services. Providing details about what’s offered shouldn’t mean depending on a menu or a nearby logo. Using colorful flags with standout graphics, customers can assimilate a stronger sense of branding. These products come in feather or teardrop shapes to stand out from surrounding advertising. Outdoor flags have a ground stake base so they easily set up on surrounding territory. If visiting an overly windy city, these items stay firmly mounted so they won’t fall over or fly away. Feather flag heights go up to 15 feet, and teardrop flags go up to 14 feet. As a result, space is plentiful to place further product imagery. This can include information about cities and communities the mobile business visits. Plus, it’s a good spot to advertise websites or social media channels to help keep customers in the know about future locations. Using dye sublimation on 3 oz. polyester, color images look as eye-popping as the photos used on vinyl banners. When serving food, a larger image of an item has a stronger chance of attracting larger crowds. 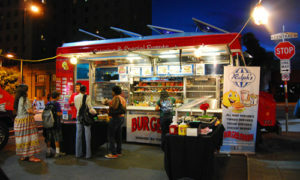 Almost all mobile businesses have an open counter on the side of the truck that serves either food or other products. Not all operate this way (some provide service strictly inside), though serving long lines can mean extra long wait times. Rather than bore those customers with nothing to do, placing a table talker on the counter can bring visual interest. These are perfect for service lines because they’re made to pick up and read. With durable materials and different shapes available, they bring a personal angle while giving detailed info not available anywhere else. Placing QR codes on these can help first-time patrons visit a website to learn about ways to get future discounts on products. By using magnets, vinyl or fabric banners, advertising flags, and table talkers, a business on wheels can promote from every conceivable angle. Every St. Louis based mobile business now has opportunity to provide advertising that nurtures customer loyalty. This commitment from consumers is extremely important for future success as competition likely increases.